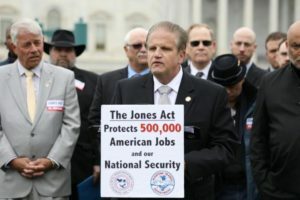 Washington D.C. – Today, Jimmy Hart, President of The Metal Trades Department, AFL-CIO , Dan Duncan, Secretary-Treasurer of The Maritime Trades Department, AFL-CIO , and their members joined together to call on members of Congress to renew their support of The Jones Act. Caption: Jimmy Hart, President of The Metal Trades Department, AFL-CIO, calls on member of Congress to renew their support of The Jones Act. “There has been a wave of misinformation told about The Jones Act. The elimination of this important law would be detrimental to the American economy and the safety of its residents. Keeping shipyards busy is vital to protecting the highly skilled labor jobs held by metal trades workers and encourages investments in the infrastructure needed to build and maintain military vessels used for national defense. 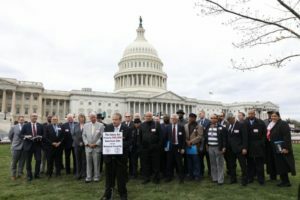 We cannot fail these working families who depend on us to make sure their quality of life remains intact,”saidJimmy Hart, President of The Metal Trades Department. “Our industry and our members will never stop promoting the truth: The Jones Act keeps our country strong by supporting good paying jobs on both land and sea. The Act is an essential component of protecting our nation’s national security. Flawed accusations have been used as a foundation to call for the weakening or elimination of the law. There is ample supply of Jones Act qualified vessels to reach every U.S. port. This is a critical maritime law that promotes industrial investment and skilled training that helps to support our national economy and defense,” saidDan W. Duncan, Secretary-Treasurer of The Maritime Trades Department. Caption: Union members stand together to support the same bottom line: The Jones Act Protects 500,00 American Jobs and our National Defense.